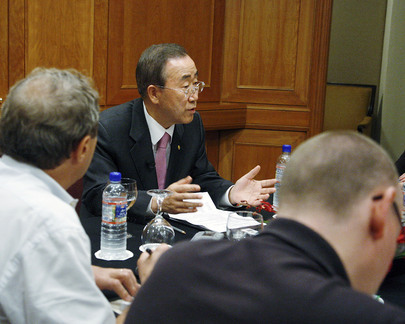 UNITED NATIONS, July 3-4 -- After the first of what may be two meetings with Burmese strongman Than Shwe, UN Secretary General Ban Ki-moon told the reporters he picked to travel with him, "I was assured that the Myanmar authorities will make sure that this election will be held in a fair and free and transparent manner." As simply one example, since the constitution the junta pushed through in the wake of Cycle Nargis in May 2008 provides that fully one-quarter of seats must go to military members, it is difficult to see how an election under it could be described as fair. Unnamed UN officials -- in New York the UN has still refused to confirm even which officials are traveling with Ban -- are quoted that the general are considering endorsing "allowing the National League for Democracy to open offices across the country and to permit her to campaign," referring to the imprisoned and on trial Aung San Suu Kyi. There is only one problem: the junta's constitution prohibits anyone who ever married a foreigner, as Mrs. Suu Kyi did, from running for office. Myanmar is not, however, isolated from the whole world. It is reportedly seeking to import more weapons from North Korea, and it on the record gave $50,000 to President Mahinda Rajapaksa of Sri Lanka, perhaps in tribute to him having done to the Tamil Tigers and civilians what Than Shwe would like to do with Karen rebels and civilians. The UN, of course, continued unabated seeking to raise donor funds for Myanmar, with the attendant run off through current exchange to Than Shwe's regime, without any question about Myanmar turning around and giving post bloodbath aid to Sri Lanka. Nor has the UN tried to track the use of Nigeria's $500,000 grant to Myanmar, on which Inner City Press exclusively reported. Ban's deputy spokeswoman Marie Okabe, who is along on the trip, is quoted telling the reporters whom she identified for the trip that Ban will have a second meeting with Than Shwe. 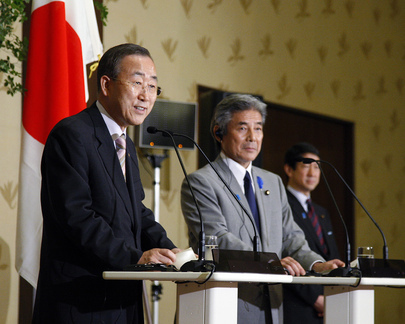 (It is not clear why Ms. Okabe or her Office could not have conveyed this announcement to other UN reporters). In the air is that Ban might then pull a rabbit out of the hat. But what if the rabbit is dead? Watch this site. Footnote: as Inner City Press reported June 28 and was confirmed by Ban's Spokesperson Michele Montas on June 29, Ban's office hand-picked which journalists would be told of the opportunity to cover his trip to Burma. Ms. Montas first said that the UN "picked people who were willing to pool for others." On July 2, when Inner City Press asked Ms. Montas when these pool reports would begin, she reversed course and argued that "I said some of them were willing to pool, some of them... There is no print pooling, no." Inner City Press asked Ms. Montas to confirm the information in a list it has seen, that there are at least 22 UN personnel in Ban's traveling party, ranging from political chief Lynn Pascoe and deputy chief of staff Kim Won-soo to Hak-Fan Lau, to whom reporters on Ban's previous UN mission to Burma gave at least some pooled material. "I can check for you," Ms. Montas answered. By 6 p.m. on July 3 in New York, no information was provided. Watch this site. 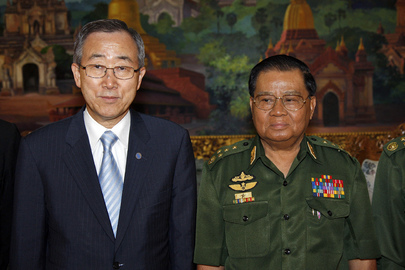 UNITED NATIONS, July 3 --UN's Ban Ki-moon told Burmese military leader Than Shwe on July 3, "I'd like to appreciate your commitment to move your country forward." Since Cyclone Nargis hit the Irradwaddy Delta in May 2008, Shwe has used the displacement it occasioned to give land under what used to be fishing villages to his regime's cronies. While to some that is "moving [the] country forward," to others it is the antithesis of the type of development the UN should be praising. While unlikely, perhaps Ban meant that while he would like to appreciate Shwe's actions, in good faith he cannot. 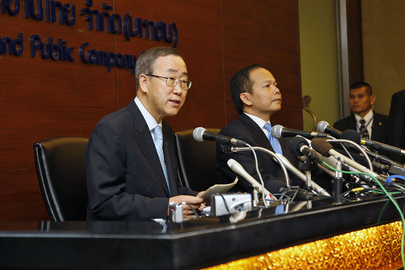 Inner City Press is told by well placed UN sources that, even beyond the currency exchange scams through which the UN allowed up to one quarter of post cyclone donor funds to be taken outright by Burma's junta, the UN Country Team continues to subsidize the dictatorship by, for example, accepting requirements to buy certain equipment in-country at inflated prices. While some argue that the UN stays silent out of commitment to remain serving Burma's poor, the staged theatrics of Ban's current trip lead others to see a darker, more mixed motive. "Ban desperately needs the appears of a win at this time," Inner City Press was told July 2 by a UN official who requested anonymity from fear of retaliation. "The generals in Naypyitaw know that, and they are using Ban's desperation to legitimatize the fixed election they plan for 2010." The official characterized the detention of Aung San Suu Kyi as a less fundamental issue, one on which Ban might be allowed to claim some victory such as her transfer from Insein Prison back to house arrest, or a commit to later full release. Such a commitment, if the past is any guide, could later be rescinded, as could the release of lower profile political prisoners during Ban's current two day trip. Who knows -- maybe Ban will claim credit for the adjournment today of Suu Kyi's trial for a week. The stated rationale was the failure of a Burmese (kangaroo) appeals court to return to court the file along with its decision barring two of Suu Kyi four proposed witnesses from testifying. 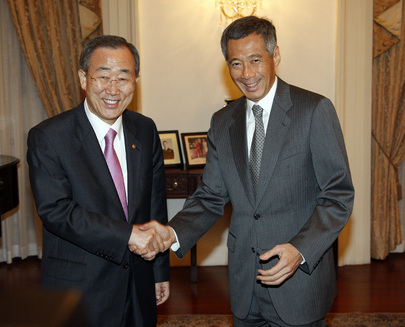 Perhaps as his entourage claims, Ban's quiet diplomacy and soft power work in mysterious ways. Watch this site. 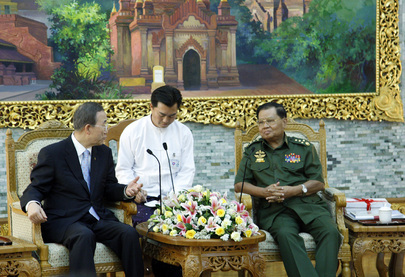 UNITED NATIONS, July 3 -- With news of his airplane's touch-down in Yangon, the carefully stage managed visit to Myanmar of UN Secretary General Ban Ki-moon began on July 3. To a group of accompanying reporters whom he had hand-picked, Ban called his task difficult but necessary. The media dutifully performed their electronic drum roll, as for a magician before he performs a sleight of hand. Clearly, Ban's current envoy Ibrahim Gambari got some commitments for photo-ops for Ban during his preparatory trip to Myanmar. These predetermined win-wins were withheld from, and apparently not obtained by, the accompanying media. Thus fresh from Ban's stop in Japan the kibuki theater began: a widely reported challenge with a preplanned denouement. But could he flub up even this? Of the accompanying wire services, two of the three -- or with Yonhap was it four? -- quoted Ken Roth of Human Rights Watch on what would constitute success, or failure, on this trip. Might Ban meet with Aung San Suu Kyi? Might she nonetheless be sentenced to further house arrest? Why is she being barred from the 2010 election? Beyond the Aung San Suu Kyi show, about about the Karen people? Even more oppressed, what about the Rohinya? The UN's Ibrahim Gambari told Inner City Press that the Rohinya, Muslims long in Burma but denied citizens' rights, are beyond the scope of this "good offices" mandate. Ironically, an Afro-Arab UN Ambassador to the UN told Inner City Press that Gambari wanted but was passed over for the job of UN envoy to Darfur because as a Muslim he was viewed by Western power as too pro Sudan. That his name was put forward for the Sudan job shows what an afterthought Myanmar is -- until Ban Ki-moon is desperate for the appearance of a win. He has chosen the reporters, and has hidden the Gambari-won hole card. But might the game still not work out? Watch this site.